Looking out my window today I see that winter is still fully entrenched in Central Ohio, which means it’s time for the second installment of Sunday Stout Soliloquies. Today we take a closer look at Plead the 5th Imperial Stout by Dark Horse Brewing. Not content with making one or two different stouts, Dark Horse releases a series of no less than five seasonal stouts gradually increasing the intensity as the weather turns colder – One Oatmeal Stout (October release), Too Cream Stout (November), Tres Blueberry Stout (December), Fore Smoked Stout (January), and Plead The 5th Imperial Stout (February). Somethings are just not debatable. One of which being, we don’t permit the playing of AC/DC on our taproom jukebox. If you try to play an AC/DC song in our jukebox your song will be skipped. No refunds. This is the cost of crappy music. I visited the Dark Horse taproom in Marshall, Michigan twice last year and I can personally attest that no AC/DC songs were heard on either visit. I’m not privy to the musical tastes of the brewers at Dark Horse, but the fact that they make a beer called Rain in Blood (a pale ale made with blood oranges) in tribute to the speed metal band Slayer makes me think that you might also lose your money if you try to play a song by One Direction or Idina Menzel on the Dark Horse jukebox. Another notable feature of the taproom is the mug club. 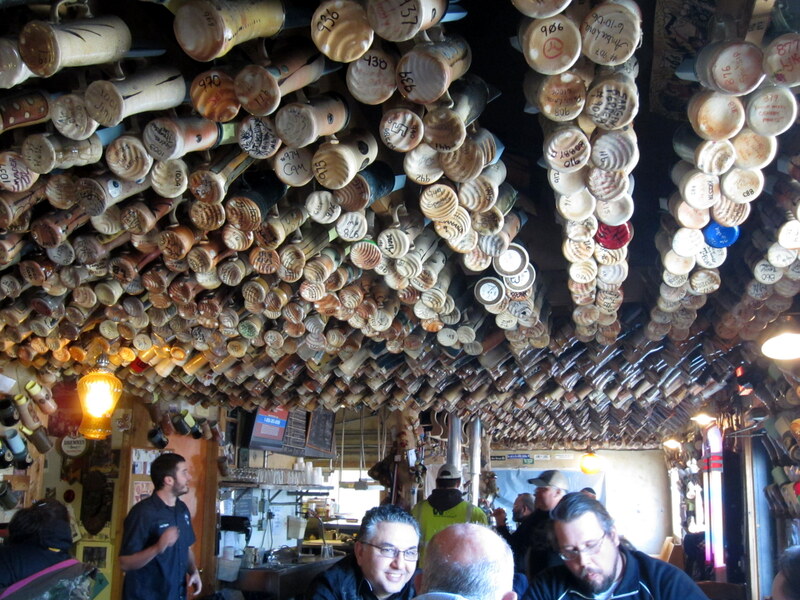 Every inch of the ceiling and a significant fraction of wall space is covered with individualized ceramic mugs that number over 3000. I guess this is what Pottery Barn would look like if it were run by tattooed, bearded, beer swilling nonconformists. This particular bottle was purchased at the brewery last March and so must be about a year old. On the Dark Horse website there is a video on Plead the 5th, which reveals almost nothing about how this beer was made (other than the fact that it no longer contains the secret root). I guess the lack of information is fitting for a beer named after the Fifth Amendment to the US Constitution. A vigorous pour yields less that 1 cm of mocha colored head atop a black, utterly opaque liquid. The nose has a surprising amount of vanilla for a non-barrel aged beer along with the typical dark malt aromas of chocolate and coffee. The taste is fittingly complex for their showcase stout with dark roasted malt flavors leading the way. There may not be a secret root, but I’m picking up something that reminds me of the brewers licorice used in The Abyss by Deschutes. There is a touch of savory soy like character, that may have developed during the year this bottle has been aging. The mouthfeel is satisfyingly thick and smooth. Compared to the elite stouts I’ve been drinking lately, the finish is a little hot but not inappropriate for an 11% abv beer. This is a big beer with a complex flavor profile. I enjoyed it but in my book it’s not as good as the featured stout from last Sunday, Jackie O’s Dark Apparition. There are some similarities with The Abyss, but not the same level of complexity. Although in fairness Plead the 5th sells for about half the price as those beers, so if you are a fan of imperial stouts and the opportunity arises to Plead the 5th I recommend you give it a try. The ceiling at the Dark Horse taproom.